As computer recording has become commonplace many companies offered up USB microphones as the ultimate direct plug-in convenience. However, most serious musicians would prefer to use the mics they already own, or wouldn’t consider anything else, for tracking the most important elements to their recordings. The Shure X2u bridges that gap, turning any serious mic into a USB microphone. And if that wasn’t enough, they then added some well thought out features to help smooth out some the wrinkles sometimes encountered in using Digital Audio Workstations (DAW). The X2u almost looks and feels as if it was made to military specs. The metal casing has substantial heft to it and any plastic parts are kept to a minimum. All of the controls are low-profile thumb wheels and the 1/8” headphone jack is flush with the surface. Only the phantom power switch (push-push) creates any kind of profile and that is only when it is not depressed. The flattened cylinder shape is designed to lay steady on a desktop, and its weight helps keeps it in place against the gravitational pull of a standard XLR cable and the somewhat lighter included 10’ USB cable. There are slots on the back side of the X2u for Velcro straps (also included) for mounting the unit to a mic stand: a nice touch that allows the singer themselves to adjust the levels to their liking themselves. The X2u has a gain control with a companion LED that registers the mic’s level: green when it hears input, amber as you approach overload, and red for when it’s too hot. Another LED indicates when the unit is plugged into a USB port and the third shows when the phantom power switch is activated. There’s also an overall volume control, and a monitor control for the audio output from the computer of previously recorded tracks. Using the X2u’s headphone jack and the onboard controls, both the direct input signal from the mic and the audio from the computer can be adjusted separately and mixed together, an elegant solution to fighting latency issues when overdubbing tracks on a computer-based system. Testing our review unit with a large diaphragm Shure KSM-27 (the precursor to the current moderately priced SM-27), a small diaphragm condenser mic of dubious origins, and a dynamic Shure SM-58 (a representation of the mics most musicians would currently have in their possession) yielded great results. As expected, the quality of the recording was dependent on the sample rate selected on the workstation and the mic at hand. However, the X2u acting as a pre-amp sounded smooth and pleasing, and represented the characteristics, sounds, and the performance of each of the mics. It would have been a nice addition to have an unbalanced ¼” line in for high-impedance mics and/or an input for other sources such as plug-in acoustic guitars, electric guitars and basses, though using an additional direct box would solved this issue. However, one must respect that Shure kept their eye on the ball and created a single function unit that works extremely well as a companion piece for what many consider their industry standard products. 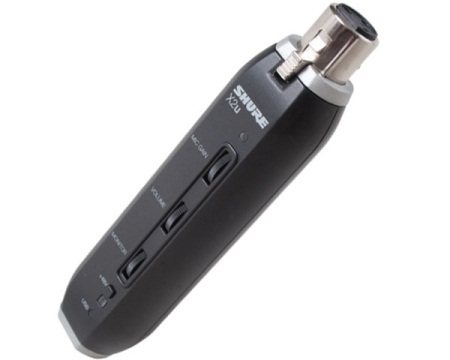 The Shure X2u is an easy way to merge the mics you love with the current standard of computer recording formats.